The UFC returns to pay-per-view with perhaps the biggest fight in company history, with Khabib Nurmagomedov defending his lightweight title against Conor McGregor at UFC 229 on Saturday, Oct. 6 live from the T-Mobile Arena in Las Vegas. The animosity between the two is at a fever pitch. Their Sept. 20 press conference didn’t include any fans inside Radio City Music Hall in New York City out of safety precautions. The presser resulted in verbal jabs being thrown left and right, ranging from political to personal barbs in nature, and ending with security on stage to accompany their tense staredown. Nurmagomedov (26-0) is regarded as the most dominant fighter in the UFC, defeating every opponent who has come in his path with his suffocating wrestling. The native of Dagestan won the undisputed title, beating Al Iaquinta in the main event of UFC 223 this past April. McGregor (21-3) will be fighting in MMA for the first time in 23 months. He last captured the lightweight title via a win over Eddie Alvarez at UFC 205 in November 2016 to become the first fighter in UFC history to hold two belts simultaneously. In between then and now, McGregor participated in a boxing match, losing to Floyd Mayweather Jr. in August 2017 by 10th-round TKO. Nurmagomedov and McGregor had always been respectful to each other through the years. 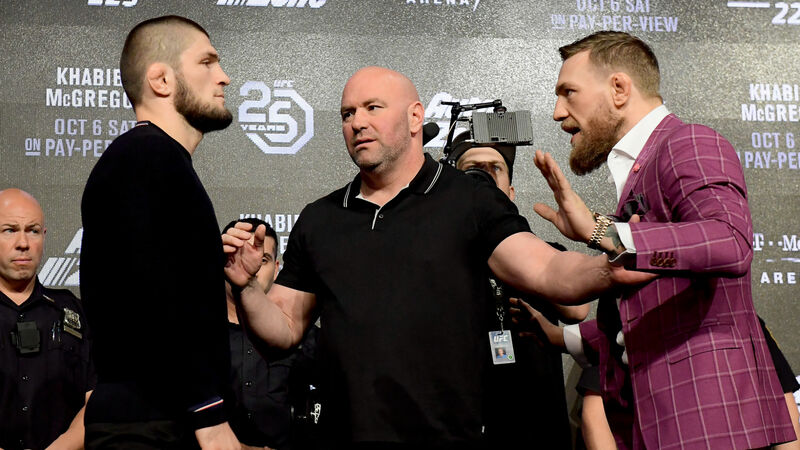 But everything changed the week of April’s UFC 223 event, when Nurmagomedov and his team surrounded McGregor’s close friend and teammate, Artem Lobov, resulting in the lightweight titleholder smacking Lobov in the back of the head. Seeing what happened, McGregor and his associates hopped onto a plane from Dublin, Ireland to Brooklyn, the site of the event, to confront Nurmagomedov. Things didn’t go the way McGregor wanted them to, as he stormed into the loading dock of the Barclays Center to look for Nurmagomedov. McGregor wound up throwing a dolly through a bus window, intending to hit Nurmagomedov, but injuring fighters Michael Chiesa and Ray Borg, instead. McGregor ended up getting arrested. In July, McGregor pleaded guilty to disorderly conduct as part of a plea deal with the Brooklyn District Attorney’s Office. McGregor was sentenced to five days of community service and ordered to attend one to three days of anger management training. McGregor is easily the biggest star in combat sports and one of the most popular athletes in the world. For Nurmagomedov and McGregor, this is beyond personal. Add in the fact that their bout is for the 155-pound title and UFC 229 has the makings to be the biggest event in MMA history. UFC 229 takes place on Saturday, Oct. 6. Pay-per-view coverage begins at 10 p.m. ET. Nurmagomedov and McGregor should enter the Octagon around 12:15 a.m. ET. The main card on pay-per-view can be purchased for $64.99. For more information on how to order UFC 229: Khabib vs. McGregor, contact your service provider. You can also live-stream UFC 229 and order the main card on UFC.TV for $64.99.